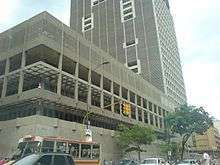 The Central Bank of Venezuela (Spanish: Banco Central de Venezuela, BCV) is the central bank of Venezuela. It maintains a fixed exchange rate for the Venezuelan bolívar. Nelson Merentes is the President of the Central Bank of Venezuela. Merentes is a representative of Venezuela for the International Monetary Fund. The currency exchange system in Venezuela is known as the "Ancillary Foreign Currency Administration System" or Sicad. The Central Bank is able to issue bonds through the "SITME" market. In 2012, it was reported that $44 million worth of bonds were purchased through SITME in a single day for Petroleos de Venezuela SA. ↑ "Oficializan designación de Nelson Merentes como presidente del Banco Central de Venezuela". El Nacional (Caracas). 22 January 2014. Retrieved 11 February 2015. ↑ "UPDATE 1-Venezuelan central bank sells $215 mln at currency auction". Reuters. 17 July 2013. ↑ Cancel, Daniel (23 August 2012). "Venezuela Sells Record $44 Million PDVSA 2035 Bonds in Sitme". Bloomberg.